Imperial Tobacco wished to consolidate their operations into one modern, high quality facility. Their existing office and factory buildings on Winterstoke Road, Bristol were demolished to make way for a new 4 storey, 100,000 sq ft office building capable of accommodating 500 staff. The structure primarily comprises reinforced concrete, with the ‘Executive Suite’ at 3rd Floor in structural steelwork. 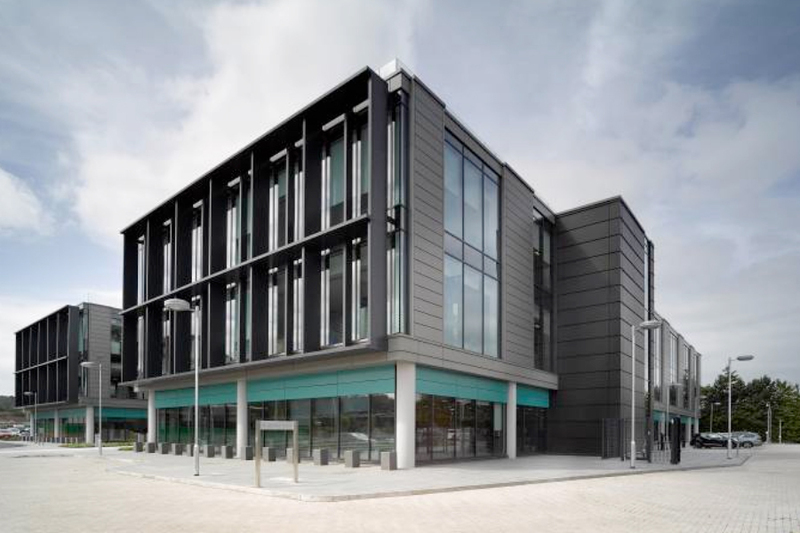 Use of environmentally friendly features, including photovoltaic cells on the roof, rainwater harvesting and a biomass generator ensure that this is a very ‘green’ building, achieving BREEAM ‘Excellent’ status. The building provides a high quality, flexible working environment, incorporating a restaurant & gymnasium. Throughout various stages of the project, Fairhrust provided Civil, Structural and Geo-Environmental Engineering services. The initial input from Fairhurst involved working closely with the client to define conceptual structural designs and the site’s Geotechnical, Flood and Drainage constraints. Following on from the definition of the constraints, and in conjunction with other team members, tender designs were developed and competitive tenders invited. On tender award, Fairhurst were novated to the main contractor to complete all Civil and Structural design.